On-board 4K recording requires high-data rate recording media, and the F55 will use Sony's newly developed SxS PRO+ memory cards. A 128 GB card will provide enough space for approximately 40 minutes of 4K video in the XAVC Intra 422 format. SxS PRO+ cards will also allow on-board recording of 2K video at up to 180 frames per second. Traditional CMOS sensors employ what is commonly known as a "rolling shutter." The F55 is among the first digital motion picture cameras with a global shutter, which completely eliminates motion skew and other rolling shutter distortions. In addition to the AXS-R5 recorder, a digital interface on the F55 allows for a variety of optional viewfinders. DVF-EL100 is a 0.7" OLED viewfinder with 1280 x 720 resolution. DVF-L350 is a 3.5" LCD viewfinder with 960 x 540 resolution, and the eyepiece flips up for direct monitoring. DVF-L700 is a 7" LCD viewfinder with 1920 x 1080 resolution for monitoring Full HD pixel-for-pixel. Other modular components include the optional Sony shoulder rig, which features industry-standard rosettes on both sides for quick and easy attachment of third-party hand grips and other accessories. The F55 is designed to accommodate a wide range of lenses. With the PL-mount adaptor, you can take advantage of acclaimed cine optics from Angnieux, Canon, Carl Zeiss, Cooke, FUJIFILM, Leica and more. Slip off the supplied PL-mount adaptor to reveal the native FZ-mount with an 18mm flange focal distance. The FZ-mount provides an interface for native FZ lenses like Sony's SCL-Z18X140 auto focus servo zoom lens or a range of adaptors for still lenses, including Canon EF, Canon FD, Nikon F, Leica M and more. The ability to render a range of exposure values from deepest shadows to brightest highlights is a crucial test of any digital camera. The F55 is capable of an impressive 14 stops of exposure latitude, low-light sensitivity and low noise in the blacks. The digital sensor's dynamic range approaches that of traditional motion picture film. The F55 incorporates the same advanced color filter array technology as Sony's flagship F65, for a color gamut that is even wider than motion picture film. On-board recording of XAVC 4K and 180 fps XAVC 2K/HD requires high-data-rate recording media. 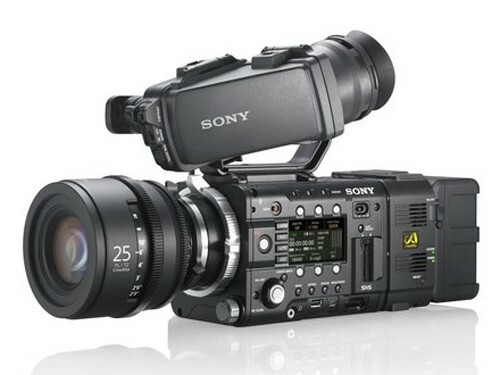 The F55 will use Sony's 64 and 128 GB SxS PRO+ memory cards. A 128 GB card will provide enough space for approximately 40 minutes of 4K video in the XAVC Intra 422 format. The F55 takes advantage of Sony's BP-FL75 battery pack, which uses Olivine Lithium Iron Phosphate instead of conventional Lithium Ion cathodes. The result is a substantial increase in charge-discharge cycles, compared to previous Sony batteries. The Olivine battery works with Sony's BC-L90 quick charger. The camera is also compatible with Sony's BP-GL95A, GL65A, L80S and L60S batteries, which use the BC-L70 and L160 chargers.